When it comes to eczema vs psoriasis, the two conditions are often confused for each other, but they are in fact quite different. According to the National Eczema Association, 31.6 million people in the U.S. suffer from eczema, with at least 17.8 million dealing with moderate to severe eczema. Psoriasis is an autoimmune disorder, but for decades the medical community has tackled the issue of whether eczema is also an immune system abnormality or if it has more to do with a defect in the skin’s barrier. Recent research leads doctors to understand that it’s more likely related to the immune system. Eczema is a skin condition (2) that produces scaly, itchy skin that then develops into an eczema rash that can get worse when the skin is scratched. This rash can turn into small, white blisters that will open and scab up if they are ruptured. Cracks in the skin and deep fissures can occur, even with elbow eczema and eczema on the scalp, so much that they may bleed if deep enough. In the healing stages, the skin will be dry and flaky. A flare-up goes through all or some of these stages, then the skin calms down, and then at some point it will flare up again and the cycle repeats itself. But it can also just randomly disappear. The causes of eczema are unknown, and it’s also unknown why eczema shows up at certain points in a person’s life and then disappears. Eczema can show up on any part of the body, but the more common spots include the hands, feet, legs, arms, and face. An eczema treatment that works on the face will work equally on other parts of the body, though caution is suggested when using cortisone on the face—use it as a last resort when other treatment options have been unsuccessful. Since we don’t know what really causes eczema (3), narrowing it down is often a matter of elimination. It’s believed that the condition flares up as a result of the body’s overreaction to what it considers an irritant. Below are some common items that cause eczema. Consider what you are using around the home or office, or anywhere else you visit frequently, and see if any of them might be triggers. If you discover some, remove them from use for 30 days and see if anything changes. Maybe try reintroducing them one at a time to see which one you’re reacting to and can then eliminate. Food is also a huge trigger for many people. Common culprits include soy, wheat, dairy, eggs, corn, nuts, and seeds. You will need to start an elimination diet to determine which, if any, are causing your eczema. Expect this process to take up to three months. Psoriasis (4) is an autoimmune disorder that makes the body create more skin cells than are necessary. This overproduction creates the patches of white/silvery flaky skin that are the hallmark of this skin problem. It can present anywhere on the body, but is typically seen on the face, scalp, neck, legs, arms, and torso. Psoriasis can look unsightly, especially when it’s in large patches that cover the body. The key is to get it under control so that the worst of it doesn’t linger. Soaking in a bath with oatmeal for 20 minutes a few times a day can add moisture to the patches and shrink them over time, and soothe the intense itch. Eczema is a kind of dermatitis, the causes of which are unknown but have been associated with environmental factors that can trigger flare-ups. It’s red, itchy, flaky, looks like extremely dry skin, and can have lesions that ooze and bleed. Psoriasis is an autoimmune disorder that causes cells to behave abnormally, and typically occurs in adults. Plaque psoriasis is the most common form that develops, and is called such because of the thick, white patches that develop. Eczema vs psoriasis on the scalp are both difficult to treat because hair gets in the way and makes it difficult for creams to be applied properly. Both eczema and psoriasis can affect the face, which can be itchy and socially discomforting. There is no real difference when it comes to eczema vs psoriasis treatment—a treatment for one can also help the other, so it’s simply a matter of finding one that works for you. 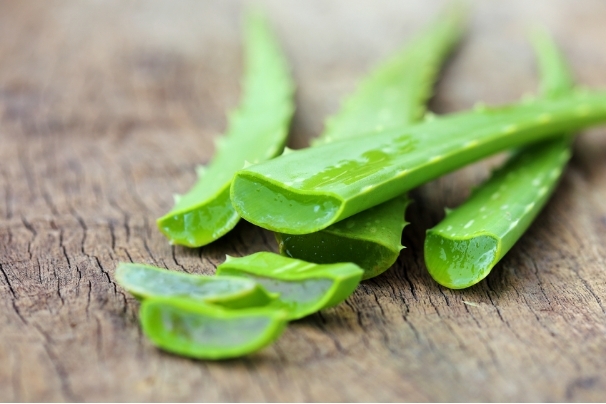 Aloe vera is an excellent all-natural treatment for psoriasis or eczema. Keeping skin hydrated is important with both conditions, because dried-out skin has a tendency to crack deeply and possibly bleed. Coconut oil and rosehip seed oil can provide intense hydration while also adding benefits of essential fatty acids and nutrients to the damaged skin. Be sure to not scratch the sores because they can easily become infected—keep them clean! If the above doesn’t work, please see a doctor for a more aggressive treatment option, likely a prescription-strength cream. What about eczema vs dermatitis? Is there a difference? Well, dermatitis (5) is simply a general term for any kind of skin irritation, and eczema is one form of it (dandruff or a rash from poison ivy are other examples). Contact dermatitis is a term used to refer to a type of eczema that is caused solely by environmental factors. Determining whether you have eczema or psoriasis can be difficult, so it helps to know what to look for (6). Psoriasis has a habit of developing in circular spots, covering both small and very large areas (e.g., covering half a limb), and these spots develop white, scaly patches. It’s this patch of dry skin and its shape that sets psoriasis apart from eczema, and that the lesions do not tend to create blisters or pus; those are standard symptoms for eczema. Both will be itchy, dry, and flaky. 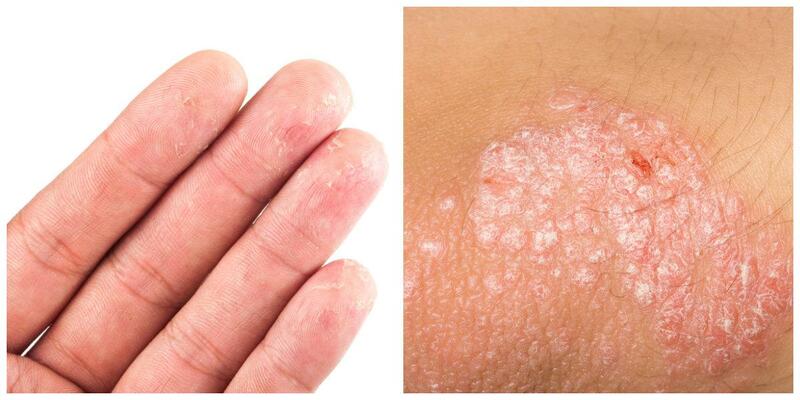 Eczema is identified by red, flaky, itchy skin, which can create blisters and lesions that ooze pus. There is no distinct marking with eczema, as it tends to spread randomly in uneven patches. The defining feature of psoriasis, typically, is that the patches of skin are somewhat circular in shape and are white, thick, and scaly as a result of an overproduction of skin cells.